Here at Profile, we pride ourselves in having the best sunbeds in the area. We have both a stand up and our ‘Caribbean’ laydown. Not only do they provide a great tan, but they also make you feel great; especially in the dark cold days. Despite the fun, and the great looks, we also take a very professional approach. We follow very strict guidelines to ensure that safety is number one priority. 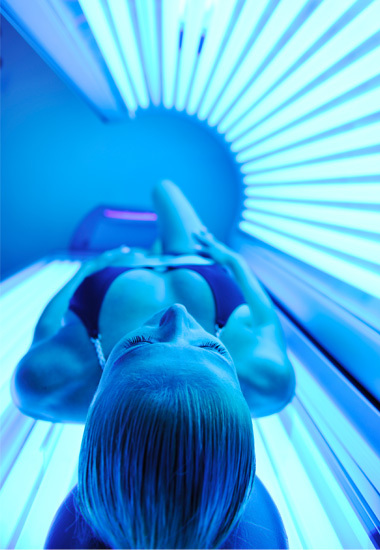 Our sunbeds are serviced at recommended intervals, and all bulbs and power are compliant with European Standards. Upon your first use, we will always advise you on the maximum time according to your skin type. We will ensure that you know how to use and operate safely. We also use Australian Gold tanning creams to help bring out a deeper and longer lasting tan. Minimum age for sunbed usage is 18yrs. ID may be requested on the day.